Online Shopping Is About To Explode! Now that we’re a week into November, it is undeniable that the holiday shopping season is here. To encourage more public support of your business, your store should be decorated to the tee by now. And the same thing goes for your website! Make no mistake that the majority of shoppers go online to browse items and compare prices before making their purchases. And, in many cases, those purchases are made directly online. It’s important to have your online store prepared for the holiday rush. With so many Canadians choosing to shop online, it’s imperative that your company website is an easy-to-use one-stop shop for all things holiday shopping. “More and more Canadians are doing some or all of their shopping online, with a whopping 77 per cent of them planning to do at least some of their spending on Amazon (last) year, according to consultancy PwC,” reports Erica Alini of Global News. Social media play a big role in boosting online sales. If you’d like to experience a significant boost in online sales this holiday season, you’ll need to be heavily active on social media. Utilizing such accounts as LinkedIn, Facebook, Twitter and Instagram, your company will be able to direct traffic to its website in order to grow its sales numbers. The PwC website highlights the significance of social media influence. Get in on the Cyber Monday action. To make your company website a popular holiday shopping destination, it will be important to update a few things about your online shopping policies. Offering free shipping on orders that exceed a certain dollar amount is an excellent way to draw the interest of consumers. You’ll also need to ensure that you make Cyber Monday a big deal! This November 26th is bound to be your biggest online sales day if you promote your company’s discounts the right way. 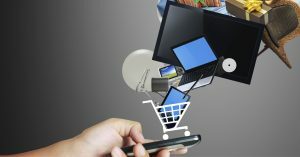 Have you invested in an e-commerce solution? Naturally, not having an online store means that you’ll be missing out on an enormous amount of sales this holiday season. At Canadian POS, we offer a secure e-commerce solution that enables you to easily and securely accept and process all credit cards – Visa, MasterCard and American Express – from your website. For more information, please don’t hesitate to give us a call at 1-877-748-2884 or email us at info@cdnpos.com.